When I first heard about this movie, I groaned and rolled my eyes. Does the world really need another Robin Hood movie? I’m still recovering from Kevin Costner’s dreadful effort. Still, I’m a sucker for historical movies so I thought I’d give it a try. Ridley Scott doesn’t seem able to make a movie these days without calling for Russell Crowe and asking if he can come out and play. 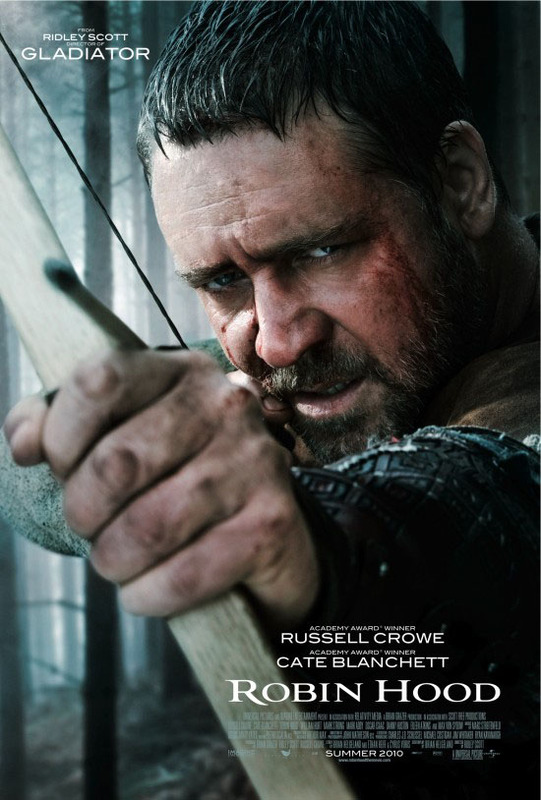 And while Robin Hood may seem like Maximus Hood on the outside, it’s a better film than Gladiator. Throwing out much of what you would expect from a story about the famous outlaw, this is instead an origin movie. Setting itself around historical events, Robin Hood explores how the man developed his penchant for the redistribution of wealth. Beginning as a bowman for Richard the Lionheart’s crusades, Robin Longstride returns to England after the King’s death to find the country subject to the tyranny of the new King, John, and the machinations of Sir Godfrey (Mark Strong in his default ‘evil’ setting), who is secretly aiding a French invasion. Robin (not a merry man) travels to Nottingham, with three of his comrades (who actually are merry men) in tow, to return the sword of a fallen soldier. There he meets Marian (not so merry) and takes the role of her dead husband in order to save her land. From here he begins his journey toward becoming the world’s most famous hoodie. Scott has a talent for big scale battle scenes, and Robin Hood is bookended by two of his best. The siege of Chalus-Chabrol at the beginning and the beach defeat of the French army at the end are both beautifully realised. Crowe carries the movie with his usual surly manner, albeit with a sometimes dodgy accent, and he is ably supported by Blanchett and an excellent Von Sydow. Mark Strong seems to be permanently stuck in the role of dastardly villain, but hopefully he’ll be able to elevate himself beyond that in Hollywood, as he did on British TV for years. 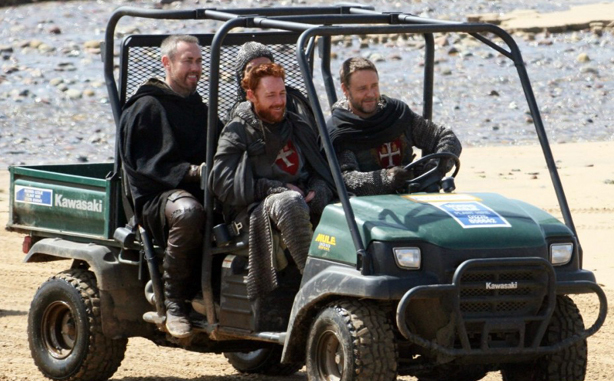 Ridley Scott decides to take a few historical liberties. Robin Hood was a lot better than I expected it to be, certainly the freshest and most realistic interpretation of the legend to be put on celluloid. There are a few historical inaccuracies, but they are minor quibbles, rendered irrelevant by the mythical nature of the subject, anyway. Zack Snyder’s adaptation of the graphic novel opens with this master class in condensing an entire back-story into a short sequence. Giving us the story of this alternative universe’s superheroes, right up until the main movie’s 1980’s setting, we see a history of the 20th century as it may have been with the addition of masked vigilantes and a superhuman. Bob Dylan’s classic folk song makes the perfect accompaniment to the beautiful, slow-motion scene-setting, and every frame looks like it was ripped straight from the pages of a comic book. They say the best movie soundtracks are the ones that you don’t notice are there. They feature music that enhances a film but never tries to compete for your attention. That’s all well and good, but personally I like the soundtracks that do both; the music that you find yourself humming later on and then buy because it is good enough to survive on its own. I’ve been listening to soundtracks for as long as I’ve been watching movies, and that’s a long time. Sometimes I’ll listen because the music is excellent in its own right, sometimes because it’s just great music to daydream to, and sometimes because a particular score is the perfect inspiration for the writing of a screenplay. I once wrote an entire script around the music to a single scene in Aliens. Thanks for that, Mr James Horner. Selecting a paltry five soundtracks from the plethora I admire was no easy task but eventually, after much hand-wringing and begging for forgiveness from the aforementioned James Horner, I settled on my Top Five. These are the soundtracks which I believe best represent the art in all its forms; as beautiful music in its own right, as the perfect enhancement to the story and visuals, and as examples of craftsmen at the top of their game. Long considered one of the most successful and enduring movie composers of all time, Jerry Goldsmith has been around since the Fifties and continues to work sporadically today. The story of his music for Ridley Scott’s Alien is one of disagreements and disappointments, but there is no denying the beauty of his work for the classic Sci-Fi/Horror movie. 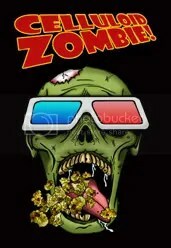 Hired by Scott at the ‘suggestion’ of 20th Century Fox, Goldsmith and the director clearly had differing ideas about how the movie should be scored. 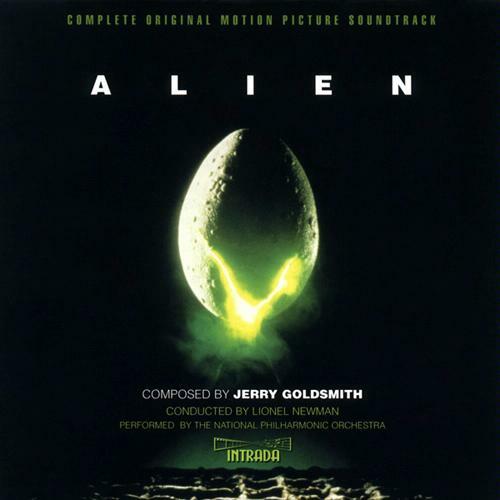 As a result, much of the music Goldsmith wrote was omitted from the final cut of Alien. The romantic, sweeping and eerie theme originally written was rejected by Scott and replaced by the composer’s second effort; a simple series of unnerving sounds which, it must be said, are extremely effective. Scott also chose to use a pre-existing piece of classical music for the end credits, further alienating Goldsmith. The original score is available in its entirety, but what remains within the film is deeply unsettling, beautiful and dark. Elements of his original opening theme survive in scenes where the Nostromo lands and takes off, making the process of landing a spaceship seem like an adventure in itself. And, taking the title of the movie to heart, Goldsmith creates ugly, unnatural sounds whenever the creature appears. Don’t ask me what they are, I prefer not knowing. See also: Chinatown, Star Trek: The Motion Picture and The Omen. 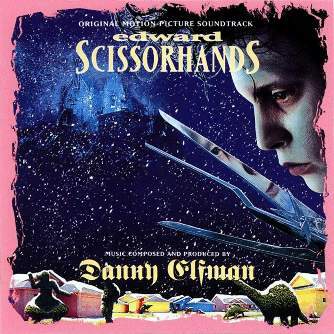 The fourth collaboration between composer Elfman and director Tim Burton, Edward Scissorhands remains one of the most influential scores of the last twenty years. Elfman began his career in film by scoring his older brother Richard’s movie, Forbidden Zone, and soon after began his creative relationship with Burton working on Pee-Wee’s Big Adventure. Utilising a 79 piece orchestra and a choir, the music for Edward Scissorhands is rich, dreamlike and perfectly encapsulates the bittersweet themes of Burton’s most personal film to date. In addition, Elfman creates a hilarious tick-tock theme for the bland suburbia into which Edward appears, and a signature bombastic march which touches on the near insanity of the inventor (Vincent Price) and his bizarre machines. Elfman and Burton represent a perfect understanding between director and composer, and even if Burton’s work isn’t always accomplished, Elfman’s usually is. They say that imitation is the highest form of flattery, and it is a measure of this soundtrack’s success that its music-box chimes and soulful choral voices have become the signature sound for fairy tales and Chanel advertisements ever since. It has even been adapted into a ballet. See also: Midnight Run, Batman Returns and Big Fish. John Carpenter has always been a curious rarity as a filmmaker. Not only does he direct and, more often than not, write his movies but he also composes and performs the soundtracks. 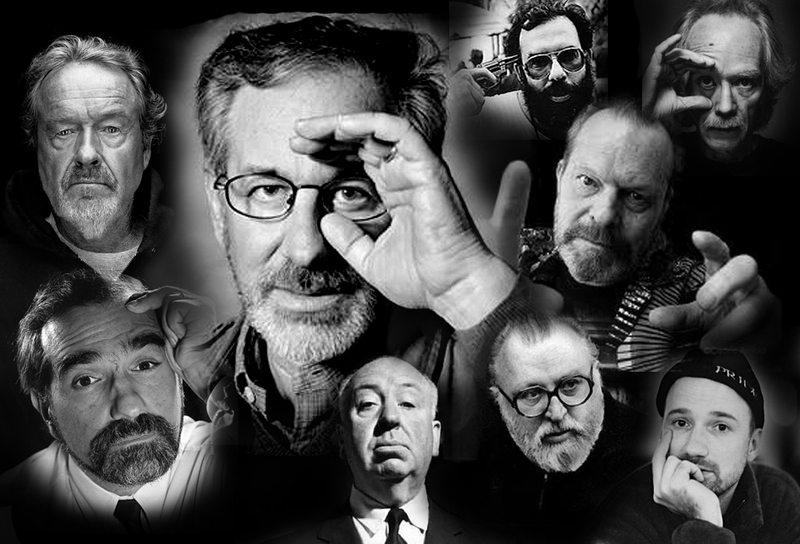 Not even Spielberg can do that (all praise His name). So, as sole creator of every component, Carpenter’s synth-based scores have always been the perfect accompaniments to the action on the screen. Often using a heartbeat thump as the base, Carpenter’s soundtracks heighten the tension considerably. His most famous is probably Halloween, but my personal favourite has always been The Fog. Carpenter uses very little in enhancing the eerie atmosphere of his coastal ghost story, but every fog horn sound and every light stoke of piano key burrows deep under the skin, priming the viewer for the experience. The thumping sound as the fog rolls into Antonio Bay mimics the pounding on doors, the noise which announces the spectres before they strike. It is one of the greatest horror movie scores of all time, by a composer who fully understands the genre. Carpenter’s band, The Coup De Villes, also provided the somewhat cheesy tunes which play on the radio, or serve as jingles for the KAB Radio station. See also: Halloween, Escape From New York and Big Trouble in Little China. If you mention Jaws in conversation, one of the first things that will come to mind is the theme tune. Dum dum dum dum, etc and so forth. Effective and iconic as that theme is, it sometimes results in the rest of the soundtrack being overlooked. 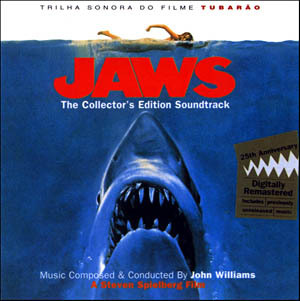 This is a shame because, beyond the ominous strings which more than compensate for the killer shark’s rather rubbery presence, Jaws enjoys one of the most accomplished scores in cinema history. John Williams has been working in the industry for half a century, and is responsible for some of cinema’s most recognisable theme tunes, including Star Wars and Indiana Jones. Jaws marked Williams’ first collaboration with Spielberg, a collaboration that has now spanned 35 years and 19 movies. By turns haunting, joyous, foreboding and terrifying, Jaws is a master class in writing music to accentuate the moving image. Williams’ strings make the ocean seem filled with dread, he quietly adds atmosphere to Quint’s tale of the USS Indianapolis, and the cheerful sea shanty which accompanies the Orca’s doomed pursuit of the Great White strikes a gloriously upbeat note in the midst of the peril. It was the perfect start to such a successful collaboration. See also: Raiders of the Lost Ark, Star Wars and Schindler’s List. The chances are there is at least one Ennio Morricone score that you love, and probably more. Morricone has been producing music for film for over 50 years, across a diverse range of genre and language. He gained wide acclaim for his work with Sergio Leone on the Spaghetti Westerns of the Sixties and managed to write a score for John Carpenter’s The Thing which sounded like a Carpenter score. 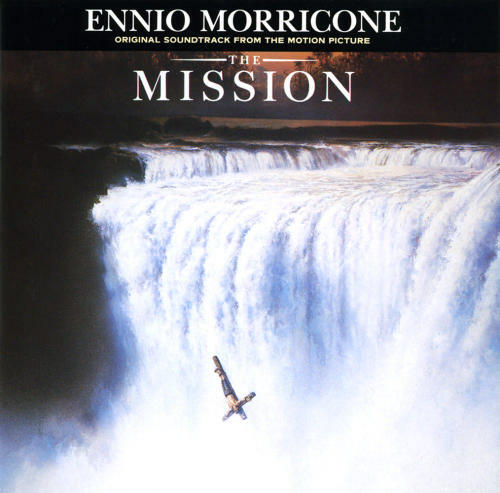 However, when I hear the name Morricone I immediately think of one movie: The Mission. Roland Joffé’s story of Spanish Jesuit missionaries in 18th century South America, and their struggles with the Spanish and Portuguese colonial governments, was graced with some of the most beautiful music ever composed for film. Morricone mixes classical Baroque orchestra, South American Guaraní instruments, Spanish guitars and haunting choirs to magnificent and often heartbreaking effect. The emotional punch of Morricone’s work even filters down to the simple tune which Father Gabriel (Jeremy Irons) plays on his oboe, a tune later reprised with full orchestra for the track On Earth As It Is In Heaven, which is breathtaking. See also: The Good, the Bad and the Ugly, The Untouchables and Once Upon a Time in America. The Also Rans: Star Trek II: The Wrath of Khan – James Horner, The Bourne Identity – John Powell, The Assassination of Jesse James by the Coward Robert Ford – Warren Ellis and Nick Cave, Psycho – Bernard Herrmann, Solaris – Cliff Martinez.